Special rules may apply if you sell mutual fund shares held six months or less after receiving certain types of dividends. The special rules described on this page may convert some or all of your short-term loss into long-term loss — or into a nondeductible loss — when you sell shares held six months or less after receiving certain kinds of dividends. When a mutual fund pays a dividend, the value of the fund goes down by the amount of the dividend. For example, if your mutual fund shares are valued at $29.75 immediately before a dividend of $1.50 per share, the value will be $28.25 immediately after the dividend. No problem there — that’s just the way stocks work in general. But it means a special rule is needed for certain capital losses on mutual fund shares. Suppose you bought the mutual fund shares just before the dividend and sold them shortly afterward. In that situation you might be able to claim a short-term capital loss that was really just a reflection of the dividend you received. If the dividend was an exempt interest dividend or a capital gain dividend, the combination of the dividend and the short-term loss would give you an unfair tax advantage. The special tax rules for short-term losses in mutual funds are designed to eliminate that advantage. Consider what would happen if you bought shares in a mutual fund at $29.75 just before the fund paid a capital gain distribution of $1.50. You’ll treat that distribution as long-term capital gain even if you held the mutual fund shares only a day before the dividend. Then you sell the mutual fund at $28.25 — the value right after the distribution. Under the normal rules, you would get a short-term capital loss. In a year when you had short-term capital gain from some other source you would gain a significant tax advantage — in effect, converting some or all of your short-term gain into long-term gain. This rule applies only if you sell your mutual fund shares at a loss six months or less after you bought them. (It’s OK to sell six months or less after the dividend.) Note that this doesn’t match up with the amount of time you need to hold the shares to have a long-term capital gain or loss. The idea is that if you’ve held the shares six months, that’s long enough so that your loss (if you have one) probably relates to genuine changes in the value of the mutual fund rather than the effect of a single distribution or allocation. When the rule applies, you have to treat some or all of your short-term loss as a long-term loss. The amount that’s treated as a long-term loss is limited to the amount of the capital gain distribution or allocation you received. If your loss is greater than the amount of that distribution or allocation, the remaining portion of the loss is treated as a short-term capital loss. 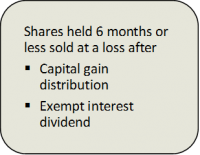 The same principle applies if you receive an exempt interest dividend and then sell shares at a loss. But in this case, your short-term loss becomes nondeductible. Example: You buy shares in a municipal bond fund just before it pays an exempt interest dividend of $1,200. Then you sell the shares at a loss of $1,300. If you held the shares six months or less, you’re permitted to deduct only $100. The remaining $1,200 represents the exempt interest dividend you received. Exception: This rule doesn’t apply to regular dividends paid by bond funds that declare exempt-interest dividends daily and distribute them monthly or more frequently. Many bond funds, but not all, follow this procedure. Also, this rule does not apply to nontaxable return of capital distributions. Those distributions reduce your basis in the mutual fund shares, so your loss calculation automatically takes this item into account. See Nondividend Distributions. The effect of these rules will not be reflected on Form 1099-B, even under the new rules that require brokers and mutual fund companies to provide more details when you sell shares. It’s your responsibility to identify situations where the rules apply and make the appropriate adjustments in your income tax reporting.